We just wanted to say a big Thank You to Dry Pro for saving our summer! Three days after school let out for the summer, our son broke his ankle (being a typical 6-year-old boy!!). 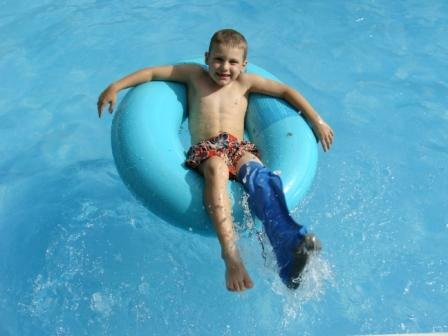 Since his grandmother has a pool and lives right down the street, he was devastated when the doctor told him that there was no way he would be able to swim with his cast on. We were bound to prove them wrong. I asked the doctor’s office if there was any sort of waterproof cover that we could use to protect his cast in the water, the nurse told us that she didn’t know of anything. So when we got home I immediately searched the internet for options and found Dry Pro! What a blessing!!! It has honestly saved our summer. There’s not much that he can do on a broken ankle and swimming is his favorite summer activity…now he can enjoy the summer (and so can the rest of us!!). So, thanks so much Dry Pro for giving us our summer back! !